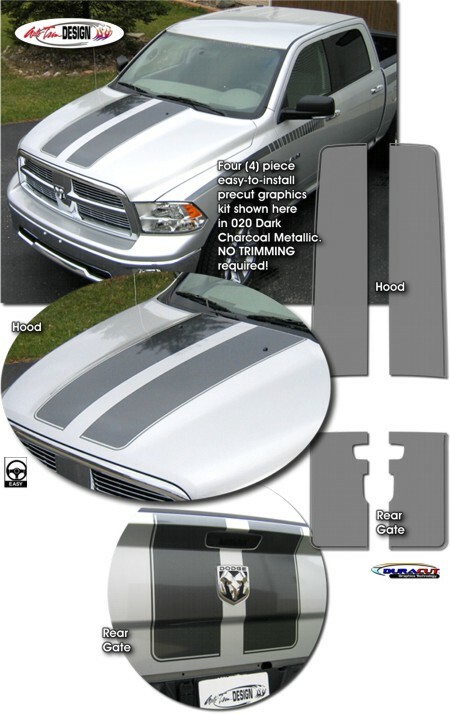 Make your '09-'18 RAM Truck "Tough-looking" with this awesome Rally Stripe hood and rear gate graphics kit. Kit is specifically made for the '09-'18 RAM Truck factory hood and rear gate areas and will not fit any other vehicle. Note: Due to structural rib supports found on the top of the Ram Truck's roof area, we offer Roof pieces as separate kits. Quad and Crew Cab Roof pieces are provided with cutouts for the structural roof rib supports.